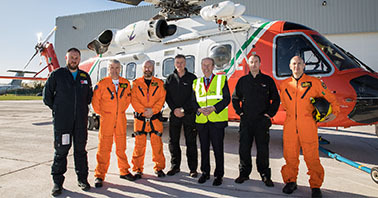 DUBLIN – CHC Helicopter (‘CHC’) opened its new search and rescue (‘SAR’) base facility in Dublin, Ireland. The facility opening, held October 18 at the Dublin Airport, was attended by Minister for Transport, Tourism and Sport, Shane Ross TD, Karl Fessenden, President and CEO of CHC Helicopter and distinguished guests. The event included a base and aircraft tour, a winching display and the unveiling of a commemorative plaque to mark the ceremony by Minister Ross.